There is a certain criticism that’s sometimes levelled at French cities – that they are too “Old Europe”; that they are beautiful to look at but that all this preservation of old buildings takes up too much energy that could be used to more creative effect. Why maintain old cities instead of building them anew? This criticism is far from the reality in even the most general sense, of course. But putting that aside, there is no doubt about how the city of Nantes has, through circumstances largely forced upon it, re-drawn the map and become one of the most vibrant places in France. It consistently ranks high in the quality-of-life index both in France and internationally. Nantes got quite a hammering during the Second World War. It was a place of strategic importance and so got the full bombastic treatment from the Anglo-American liberation force. The city centre has many elegant squares and fine 19th-century buildings, but most of them have been rebuilt from blueprints in the 1950s and 1960s. The second catastrophe of significance to strike Nantes was the post-industrial one. The city had a lot of heavy industry which began to disappear. The heaviest and the most significant of these was the ship-building industry. On the Ile de Nantes (the large 5km-long island in the middle of the Loire river in the city), the ship-building finally stopped for good in 1987, leaving behind it on the island a huge infrastructure that had developed around the business. What to do with it all? Nante’s story isn’t unique and many major cities in Europe have large docklands areas that needed to be revamped, rebuilt and gentrified. 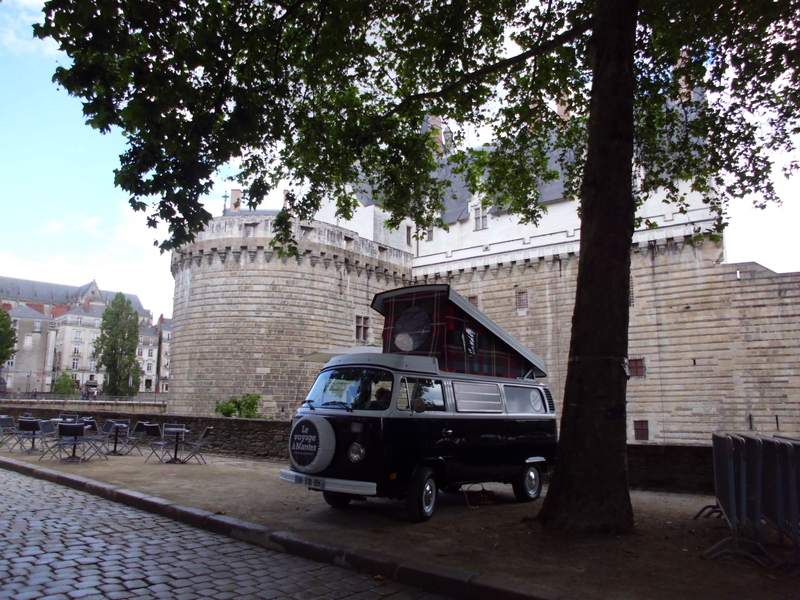 In the case of Nantes, they poured all resources into innovation and creativity. It was something of a gamble to put so much emphasis on the artistic and the imaginative, but it has worked: There are now incredible places to witness this creativity in action and have lots of fun in the process. One example is the former “LU” biscuit-factory in the centre of the city. They’re still in business but much further out of town. Their factory, meanwhile has been re-christened Lieu Unique (Unique Place). Inside, the enormous covered industrial spaces have been used to the maximum, with an indoor playground (full of crazy new games including “3D basketball”), long cafeteria for cheap eats, ongoing creative workshops and one of the largest hammans in Europe. The biggest show-piece, however, has to be the former shipyards and ancillary buildings on the Ile de Nantes. Today, these cavernous buildings house some extraordinary activity. Where else in the world are you likely to see teams of grown men and women engaged in the construction of mechanical versions of natural creatures and plants? Nowhere else, I’m betting. You can visit the workshops, where the jovial (and why wouldn’t they be?) on-site engineers explain how their creations work and give demonstrations for the entertainment of the public. Fancy a go on a mechanical caterpillar? You’ve come to the right place. 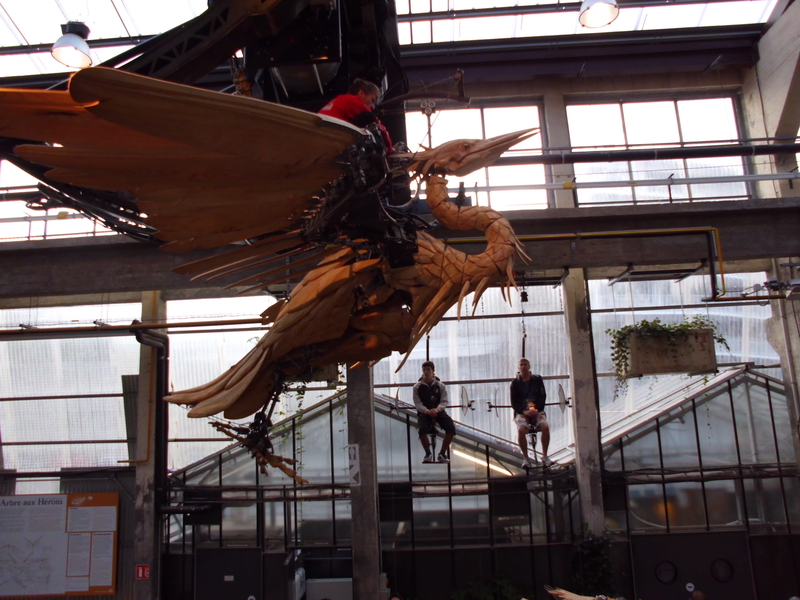 Ever seen a giant Venus fly-trap or a pterodactyl made from steel and carved wood? All the machines have a wonderful turn-of-the-century look about them – their designs heavily based on the works of Jules Verne (local boy) and Leonardo da Vinci. The first of their projects was the giant elephant. This huge construction is a sight to behold as it walks around the island on its 45-minute trek about 4 times a day, carrying over 40 passengers on board. Its legs move, its eyes move and its magnificent leather ears flap. It even bellows and squirts water. The next project is the Giant Carousel. That has just opened on the Ile de Nantes. It’s a super-sized carousel with three levels and the theme is again a mixture of Jules Verne’s “20,000 Leagues Under the Sea” and Leonardo da Vinci’s futuristic drawings. The ride is like no other carousel ever seen, however. On the ship, for example, thunder and lightning (made in the old-fashioned cinematic fashion using aluminium sheeting) is added and real water splashed on the occupant to give the maximum effect. The upcoming project, the workshop people say, is due to see the light of day around 2017. This is more ambitious again. It involves an enormous mechanical tree. People can walk out onto the branches and growth is provided by specially-engineered solar-panel-driven hanging baskets of sorts, ensuring continued greenery without requiring watering or planting in the traditional sense. There is also a pterodactyl that transports people around the tree in baskets hanging underneath it and you can go from branch to branch on either a caterpillar or a mechanical ant. All the prototypes are set up but whether or not the money will be there to see this monster dream realised is another question entirely. Word on the ground is that this thing will never fly, but I’m not so sure. This is Nantes, after all… where anything is possible. Excellent article! We stopped over there on the way up to Roscoff before the ferry. The perfect stopover for bad weather. Really enjoyed it. Anne & Bob Hegarty.